What is a sock blank? Some of you are sure to be familiar with those and others maybe not so much. A sock blank is a machine knit “blank” or a piece that looks like a short, wide scarf. A sock blank can be knit single or double and it is important to know which type you are buying because this will determine how you can use the blank for your knitting. A single knit blank will be twice as long, more or less, than a double knit blank. But the most important difference is that a single knit blank means that you only have 1 thread to work with which is fine if you are knitting one sock at a time or one mitten at a time or something like that. 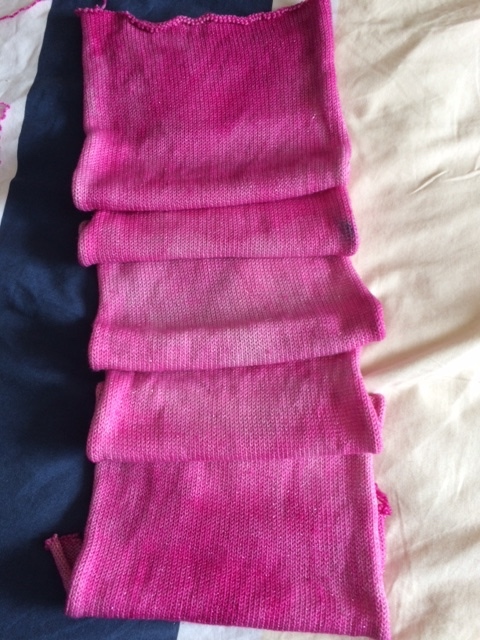 However if you were planning on doing a TAAT sock project or something similar you will want a double knit blank where you unravel 2 threads at a time and can thus knit 2 separate pieces. 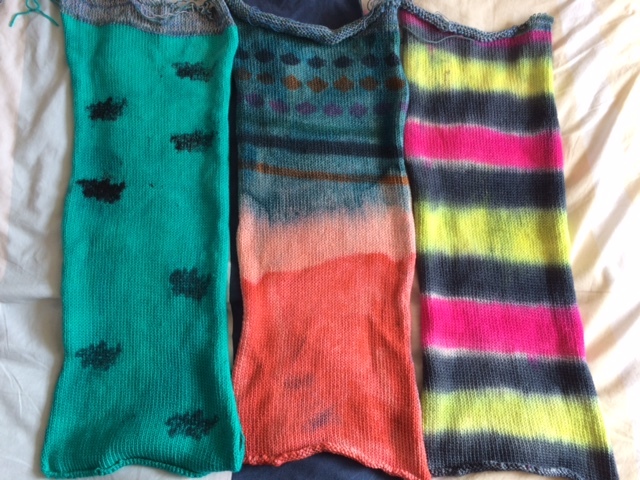 Dyeing sock blanks is a challenge I feel. 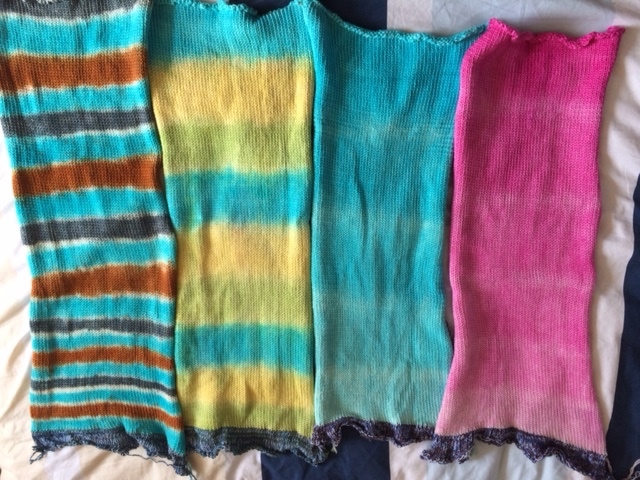 You can do different things and maybe more with some regards versus dyeing a hank of yarn. However you should keep in mind that the pattern on your blank is not going to be reproduced exactly in your pair of socks for example. If you have a striped design, your socks will be striped but the final patterning will be different as everything depends on your needle size, the amount of stitches used and of course your pattern. Also if you design has dots or geometric designs for example, these will translate into a more sort of varigated design in your socks or other small circumference knit. 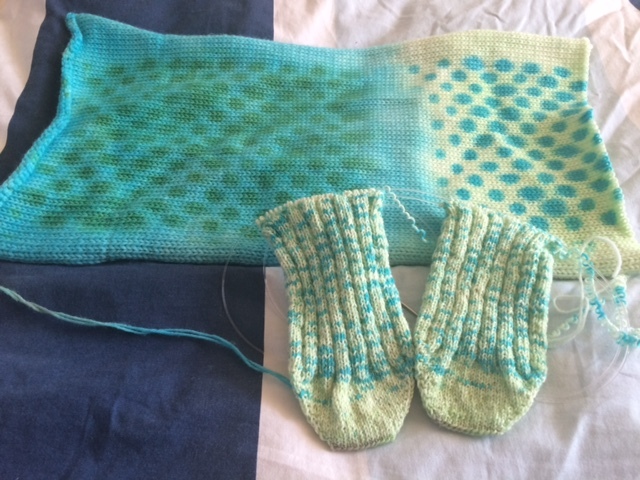 Here’s a picture of a pair of simple socks that I’m currently knitting using a blank that I dyed a while back. This was one of the first blanks I did and I first dyed each half in a different colour. Then I decided to overdye by doing a sort of dot design on top of the main colour. And on the picture below you can see the blank and its design and how the pattern then translates into the actual socks that I’m knitting. These will be simple afterthought heel socks and the front is 3×2 ribbing. You can see the dots in the blanket and how this gives a varigated end result. This is a double knit blanket which enables me to knit 2 socks at a time.